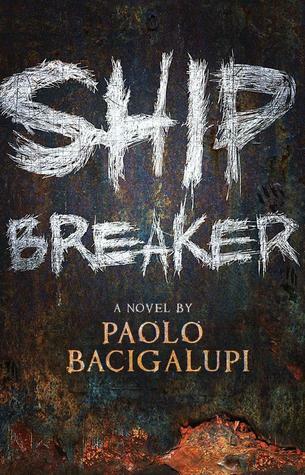 Bibliographic information: Ship Breaker. Paolo Bacigalupi. Little, Brown Books for Young Readers, 2010. $17.99. 326p. ISBN-13: 9780316056212. Summary: Nailer works as a scavenger for copper wiring on beached oil tankers. He spends his days climbing through poisonous dangerous crawl spaces to make a little money to survive because his violent drug addicted father is not use. One day he ends up falling into an oil well in the tanker he was stripping and gets stuck. When his work buddy finds him, she leaves him there to die in hopes that she can claim the oil for herself and get rich. Nailer apparently has a lucky side and finds a way out by breaking through the oil well door and landing in the ocean, oddly enough, in one piece. This means he doesn’t get to claim the oil, his boss does, but at least he is still alive and the work buddy who left him behind is shunned away. Not long after that there is a huge storm that lands a lot of beached ships on their shore. Nailer finds a beached clipper ship with a sole survivor, a girl about his age. Now Nailer has to decide whether he is going to kill the girl and strip the ship or save the girl and potentially gain a new life. It all depends on whether he can trust the girl or not. Review: Winner of the Printz Book Award for 2011 as well as Notable Children’s Books, Best Fiction for Young Adults, and Children’s Books of the Year. This young adult dystopian novel is a little different from what you may be used to. The characters of this story are complex, but incredibly realistic and loyalty is one of their main attributes. Nailer is struggling to survive in a dystopian society based solely on harvesting goods from beached oil tankers. He puts himself at risk each day so that he can make a little money to live from. When he is faced with a difficult decision, his conscience wins out and he can only hope it was the right choice, but it does bring him on a life changing journey that will only add to his character. Morals seem to be fickle things in this story and Nailer seems to have the brunt of them. This trilling adventure will captivate the minds of teen readers and pull them into a vivid world of brutality and hardship that will keep their attention all the way through. Readers’ annotation: After a huge storm blows through, Nailer is left with a choice of life or death. And it all hinges on a girl he found. Bibliotherapeutic usefulness: This book shows teens that there are other young adults in the world that are struggling through life and that they are not alone in their struggles. Also, of all the characters Nailer sets some great morals for children to follow. Issues present: This book kind of reminds me of Lord of the Flies where everybody is just brutal savages and everybody is out save themselves and nobody else. Parents and even teacher might object to the blatant violence and savagery in this book. However, the real world is brutal and savage, maybe not as much as in this book, but it will prepare kids for the real world and make them less afraid. Booktalk ideas: Introduce Nailer’s character. If you had to choose between money or saving a girl’s life who could potentially kill you, what would you do? Why I chose it: This book was recommended to me by a friend and the concept sounded intriguing so I gave it a go.